Tis the season for giving…and the Social Ministry Planning Group invites you to consider giving an alternative gift in honor or memory of a loved one. Alternative giving allows you to use your resources to give twice…a thoughtful gift to someone you care about and a gift to our neighbors in need. This year we have chosen three local organizations, ECHO, GIFTS Men’s Shelter, and Cornerstone of Hope. For all donations, please make checks payable to St. John Lutheran Church so that they can be counted for matching funds from the SJLC Foundation. 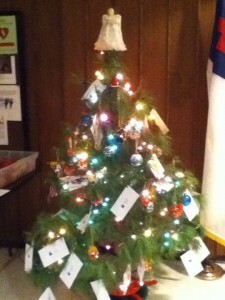 Take an envelope from the tree in the narthex and replace it with an ornament. Choose one of the organizations listed on the envelope and fill in the amount you want to go to that organization. Dedicate your gift in honor or memory of someone and write their name on the envelope. Your gift will be recognized in the Christmas bulletin. For our Global gift suggestions we are using the ELCA Good Gifts Program. We will have ornaments representing the various options for gifts hanging on the windows between the narthex and sanctuary. You are invited to choose an ornament and give it as your gift to someone. Please put your donation in the envelopes provided and indicate your name, the gift you are giving and the amount given on the envelope. The display on the glass wall in the Narthex has the details about this program! For all donations, please make checks payable to “St. John Lutheran Church” so that they can be counted for matching funds from the SJLC Foundation. Next week, we will detail the global organizations that we plan to support this year and how you can participate in that giving as well! Matching grants will apply to these gifts also.